Tenuous Markets Bracing for Vindictive House Dems, Budget Crunch, plus an interview with Michael Pento. Listen at DOWNLOAD MP3 or read the podcast below! Mike Gleason: It is my privilege now to welcome in Michael Pento, President and Founder of Pento Portfolio Strategies and author of the book The Coming Bond Market Collapse: How to Survive the Demise of the U.S. Debt Market. Michael’s a well known money manager and a terrific market commentator and it’s always great to have him on with us here on the Money Metals Podcast. Michael, thanks for coming back again, and welcome. Mike Gleason: Well Michael, the Dow rallied 600 points this week when Fed Chair Jerome Powell hinted that we are approaching the end of a tightening cycle. To many of us, the potential for a policy change comes as no surprise, especially given the recent carnage in the stocks. We live in a world addicted to cheap money, and frankly, we’ve been surprised to see the FOMC get away with as many hikes as it has. What did you make of Powell’s comments? Did the consensus around three to four rate hikes in 2019 get blown up? Is the December rate hike still on the way? What are your thoughts? Let me just say that on October 3rd, Jerome Powell said that the Fed is very far away, very far away from neutral. And that the Fed would have to go perhaps a half of a percentage point above neutral. So, they think neutral, right now the effective Fed funds rate is 2.2%. The range is two to two and a quarter. Let’s just say that neutral for the Fed is around three. Jerome Powell said that not only are we very far away from three, obviously, 75 basis points or three hikes, or 100 basis points away, four rate hikes, in the 25 basis point range. But also that they would have to go 50 basis points above that range. Now, he comes out yesterday in front of the Economic Club of New York and said this. “We are close to the range where the FOMC thinks that rates would be neutral.” Now, let me just tell you, there is no such thing as a neutral Fed funds rate that’s neither stimulative to growth or depressive to growth. That just doesn’t exist. Let’s just start there. But let’s also admit that saying that you’re close to a range, which has a bottom to a range, a midpoint to a range, and an end point to a range, to say that you’re close to a range does not mean – as Wall Street took it to mean – that the Fed is now on hold. The Fed is not on hold, by any means. I think they’re going to go on hold by June of 2019, but they are not, repeat not hold now. The Fed is raising interest rates, one time in December, in my view, they will go again in December. And they will go again probably in March, and the June hike I think will be the last one. That’s when it’ll be obvious that the economy is falling off the table. Look at auto sales, and home sales. We had a reading yesterday of new home sales, they fell 12% year on year. The interest rates sectors of the economy are falling off a cliff. And that’s not known to The Fed, because they look at lagging economic data, and apply it to models that have never worked. So, the Fed did turn a little bit more dovish, but not anywhere near as what Wall Street thinks they have turned. Mike Gleason: You haven’t been too optimistic about corporate earnings growth in 2019. You wrote a piece a couple of weeks ago which laid out why the recent tax cuts drove earnings this year, but the outlook for the coming year is not nearly as good. GDP growth may have peaked. There is evidence of slowing around the world. Rising wages and other costs that could start pinching profits, but as discussed, the Fed may be changing course now. Michael Pento: Well, listen, the global economy is not doing too well. China is slowing their growth rate very rapidly. You won’t hear this on CNBC most likely very often, but I will tell you that, did guys know that the third quarter in Japan was actually in contraction? Did you guys know that Germany, Q3, was in contraction? And you might not know that, because if your audience, which is by far more informed than the average audience that watches CNBC, but thank God that you have people come on your program who are independent and not carnival barkers beholden to Wall Street, who can tell you that the global economy, the growth rate of the global economy is bending down to the South very quickly. If you look at a stronger dollar, if you look at the fact that there’s increased wage pressures on corporations, if you look at the fact that margins have peaked and are rolling over, if you look at the fact that global economy is rolling over very quickly, and you’ve had eight rate hikes from the Federal Reserve, they’re going to do the ninth one in December, and the Fed is draining still, you didn’t hear boo about this from Mr. Powell at his speech yesterday. The Fed is still burning, destroying $50 billion of credit and cash from the banking system each and every month, Mike. So, to think that earnings in 2018, earnings per share, on the S&P 500, the trailing 12-month earnings, is going to come in at around $162. And Wall Street has somehow placed a number on 2019 in the growth rate area of close to double digits. You’re talking about $175, $178, their ranges are around that area. That’s just not going to happen. So, what I think, in my opinion, you’ll be lucky to get growth rate at all in earnings per share, and why in the world would you slap anything more than a 15 multiple upon that? I’m looking at the S&P 500 way overvalued here, in a best-case scenario. That is also seeding to this fact that we don’t have an escalation in the trade war, and that Jerome Powell doesn’t render the economy in the United States into a recession in 2019. Both those things aren’t guaranteed. So, the S&P 500 is overvalued right now, and that’s the best case scenario. Let me just quickly add this for you and your listeners. Just looking at earnings per share is a huge mistake, if you’re looking at the P/E ratio. So, the price to the earnings ratio, if you’re just looking at that ratio, you’re grossly underestimating the valuation of the stock market. Mike Gleason: The reason you don’t hear about this stuff on CNBC, Michael, is because they’ve blackballed people like you it seems. Is there something to that? I mean, it seems like that they want to suppress the people like yourself out there that are trying to speak truth into these markets. Is that part of their narrative to keep the whole thing going, just having nothing but optimistic viewpoints? Michael Pento: Listen, I’ve asked myself that question a lot Michael. I try to ask myself why am I blackballed from … I mean, I’m persona non grata from not only CNBC, but Bloomberg as well. And I ask myself, “Why would that be the case?” I honestly asked myself that question, because there are other people out there who are bearish, and by the way, I’m not bearish all the time. I was wildly bullish in January of 2009, after being bearish for several years before, heading into the housing crisis. I was on CNBC twice a week. And I’ve come to the conclusion, this is the conclusion I’ve reached, true or not, this is how I honestly feel. I think CNBC and Bloomberg et al see me as a dangerous individual. The reason why they think I’m a dangerous individual, not only because I have a ton of facts in my head when I come on CNBC and come on these mainstream financial media outlets, and just bury people who have a contrary view. I come out with facts, I base my opinion on facts, and then I express my opinion. I don’t have an agenda. But the real reason why they think I’m dangerous is because I confront the Federal Reserve for what they are, and I’ve called them legalized counterfeiters, okay? When you call a central bank a counterfeiter, I think that they banish you into a wasteland. So, I’m persona non grata, across the financial media, for that very reason. Because I call out the Federal Reserve for what they’re doing. See, money has to be real for economic growth to be real, and when money’s real, you talk about what makes money real … there’s a reason why, I believe, the United States and the rest of the world during various times in our histories, went on a gold standard. Because the mine supply of gold is limited, it tends to rise commensurate with the increase in the labor force growth, plus productivity. And in that regard, keeping that base money supply feathered, restricted to that growth rate, you eliminate the possibility of asset bubbles and inflation. But here you have a central bank, ordained by nobody, it was Congress gave them authorization in 1913, but nobody gave them authorization to counterfeit, let me say it again, because that’s what they do, credit, trillions of dollars’ worth of credit from nothing, ex nihilo. Who gave them that authority? I come out and attack The Fed for what they are, and by the way, the Fed is not alone. The Bank of Japan is much worse, the European Central Bank is much worse, and the People’s Bank of China is much worse than The Federal Reserve, but together these central banks printed $14 trillion in the last decade. They did that for a couple of reasons, to take interest rates to zero and below, so they can re-inflate asset prices, so people can’t afford a house anymore. There’s no freedom left in this economy, and that’s what makes me dangerous. I point to the fact that central banks have distorted the so-called risk free rate of return on government backed paper, and everything is priced off of that risk free rate of return. Everything out there that you see, the price of junk bonds, the price of municipal bonds, the price of equities, the price of homes, are all massively distorted because of what the central banks have done. They don’t really like hearing that, but I think you and your audience deserve to know the truth. Mike Gleason: Yeah, well their loss is our gain as far as I’m concerned, and glad you continue to share your insights with us here. 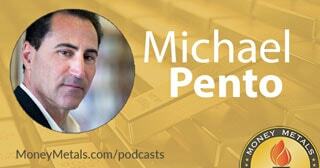 Michael Pento: Well, as you know Mike, I run an actively managed fund. I have a strategy called the inflation/deflation economic cycle model. We have been very much underweight, precious metals, you can pull up all of our past interviews since the years I’ve been on with you. I’ve said since pretty much 2013, that we should be underweight with metals, maybe about 5% of your portfolio, and that includes mining shares. I recently, on the wake-up Powell’s speech, he did hedge a little bit, lean a little bit more towards being dovish, so I did purchase a few more percentage points of precious metals in the portfolio. We’re about 7% now, allocated towards that sector. But I want to tell you this, make this very clear, I believe that for the 13th time, 13 out of 14th time, since World War II ended, the Federal Reserve is going to push the economy over a cliff. And you’re going to have a recession/depression, probably in the latter half of 2019, that’s when it’s going to start. If you look at things like LIBOR, the London Inter-Bank Offered Rate, that rate has gone from 0.3% to 2.73% today. And the Federal Reserve continues, as I say, to destroy in fiscal 2019, which started in October, they’re going to burn $600 billion worth of cash and credit from the system. Of course it’ll be too late, but when they say that, that’s when the dollar will start to roll over. That is when real interest rates will start to fall, and gold and silver and platinum and the whole precious metals sector, especially the minors, which have been beaten down for five years, it’s been a crap show for investors, that is when they, I think, are going to rip higher like we have never seen before. Not until then, but it’s happening, and my guess again, will be June of 2019. Right around that time-frame. So, get prepared, I just want to say. Don’t jump in right now, but when you see the economic data start to roll over very hard, and I think that’s an early 2019 event, and Mr Powell already played his hand. He’s in business to protect Wall Street. He’s going to stop raising interest rates, then he’s going to lower interest rates, and then he’s going to go back to QE. This is all a second half 2019 event, and you have to get ready now. And if you see some gold coming in, you have a good opportunity to buy some, or if you don’t have some already, start dipping your toe into the water, because it’s not years away anymore. It’s a few quarters away at most. Mike Gleason: We’ll leave it there. Very well put. We appreciate it as always, Michael. Thanks for your wonderful insights and being so generous with your time as always. Now, before we let you go, please tell people about Pento Portfolio Strategies and then also how they can follow you more closely if they’d like to do that. Michael Pento: You can go onto my website, brand new website, just updated, so it’s PentoPort.com. You can for free, get a trial subscription to a podcast that’s $49.99 a year. You get all these kind of data points, the kind I say on your program. It’s really not promulgated by the mainstream financial media. You can also sign up for an account. I run an actively managed, sort of like a hedge fund strategy, without all those fees. It’s one and a half percent on assets under management. And I allocate your assets according to that inflation/deflation and economic cycle model. So hopefully you’ll be long gold and precious metals when we’re inflating, and when interest rates are falling. And by the way, you can short the market, too, here. We buy inverse ETFs, we don’t use leverage or margins, but we try to capitalize on a decline in the stock market which I warned on your show, and I wrote about this in April of 2018, I said beware of the fall. I gave you top eight reasons why the fall was going to be a negative for the stock market, that’s exactly what we have done. Everybody was panicking in October. Our investors were happy. The website is and again, it’s PentoPort.com, and my email address here is mpento@pentoport.com, or you can call the office 732-772-9500. Mike Gleason: Well, thanks again Michael. I hope you have a great holiday and a wonderful Christmas season, and we’ll look forward to catching up with you again sometime during the first part of the New Year. Take care. And don’t forget to tune in here next Friday for next Weekly Market Wrap Podcast, until then this has been Mike Gleason with Money Metals Exchange, thanks for listening and have a great weekend everybody.